Last year, I wrote an accounting of all the projects I’d completed in 2015. 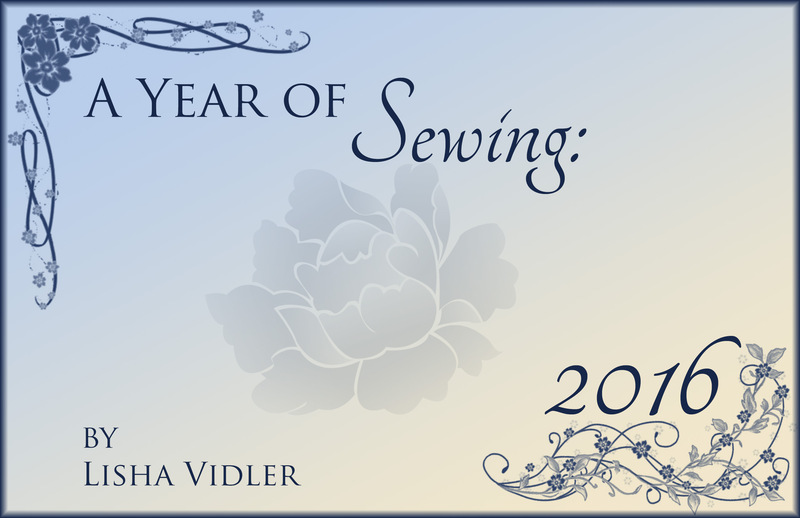 It always feels like I don’t finish any of my sewing projects, so composing a list helped me see how much I’d actually accomplished during the year. I didn’t get as much done in 2016 as I’d hoped, due to poor health, but I still managed to finish a respectable number of projects. 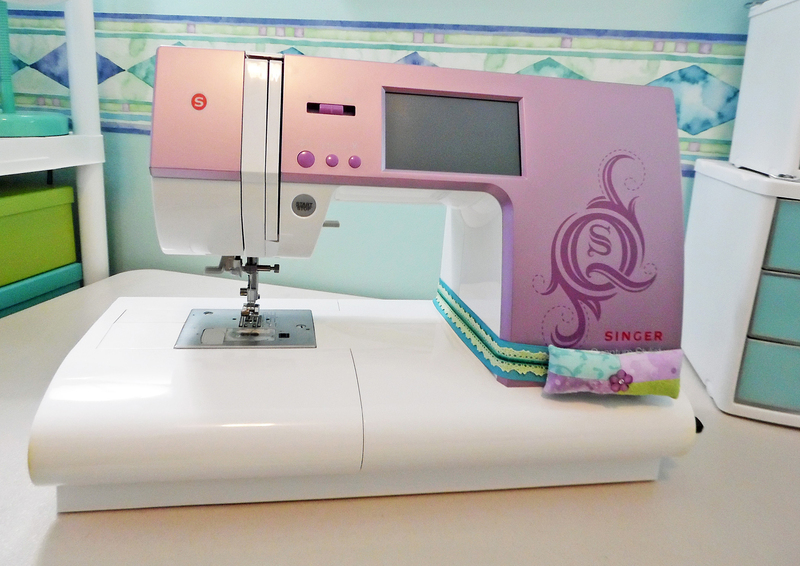 Take a look. . . .
One of my young students needed a pincushion attached to her sewing machine, so she would have somewhere to stick her pins as she removed them while sewing. I knew her favorite colors, so I whipped up a pincushion for her. 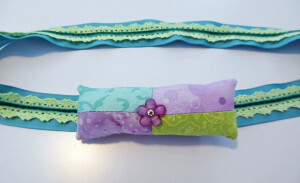 It’s a rectangular patchwork of lavender, lime-green, and aqua, with a glittery purple flower button accent in the middle. 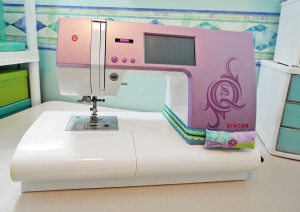 The pincushion is attached to a strap that wraps around the main part of the sewing machine and fastens with Velcro. After making a pincushion for my student, I realized how handy it would be to have one for myself. 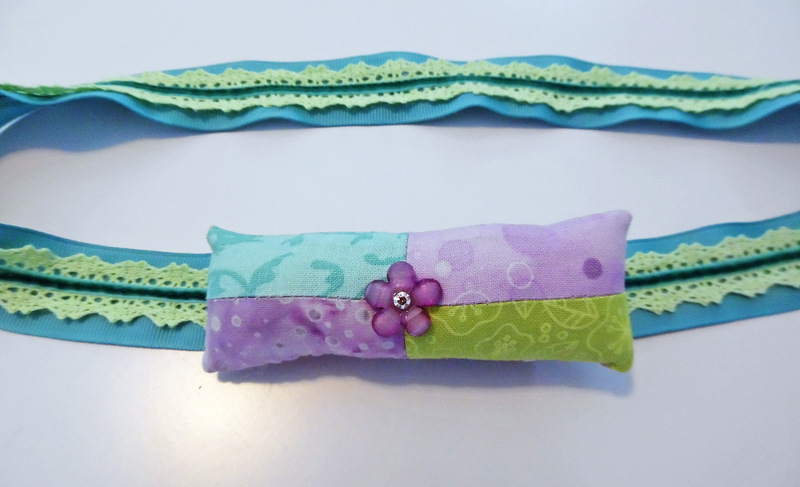 So I made a second pincushion, using the same fabrics, which happen to match my sewing room’s décor. Only the strap is different, since I didn’t have enough of the same materials. 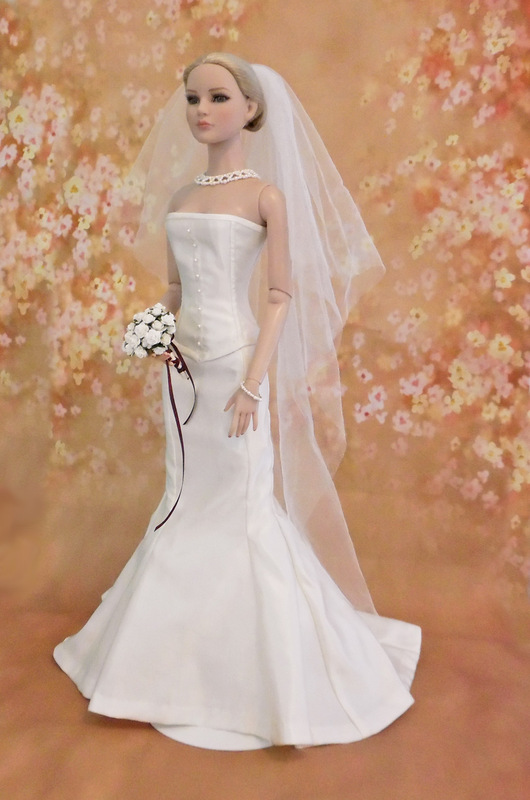 This was my favorite project from 2016—a wedding ensemble for a 22″ fashion doll (American Model by Tonner). 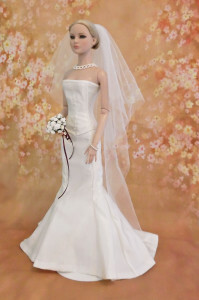 The outfit includes a mermaid skirt and corset bodice, made from a gorgeous cotton/silk blend fabric in pale ivory. The mermaid skirt is slim to the knees, then flares out, extending to a cathedral-length train in the back. 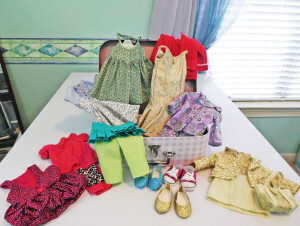 It has a built-in petticoat lining, with a gathered ruffle of embroidered lace to support the lower skirt. The bodice is a fully-boned corset. The boning was made from narrow cable-ties (zip-ties). It laces up the back with tiny hand-bound eyelets and it’s embellished down the front with a column of Swarovski pearls. Pinned into the doll’s hair is a cathedral-length veil that I created from a remnant of shimmer illusion from when I made my own wedding veil. No bride is complete without her bouquet, which I fashioned from miniature paper roses. I used beadweaving to make a coordinating necklace out of pearlized seed beads and Swarovski pearls, plus a matching wire bracelet. I have a medical condition that causes photosensitivity, which means I can’t be exposed to much sunlight without breaking out in blisters. 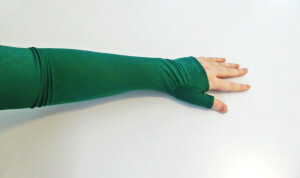 It’s awkward to wear long sleeves in the summertime, and I was tired of draping myself with a baby blanket while riding in the car, so I decided to make a pair of long fingerless gloves to protect my arms. I found a pattern for Victorian mitts, whose directions were a bit finicky, but it produced exactly what I needed. I used a slubbed tissue knit jersey in a dark greenish-teal, which is thin, yet opaque enough to block sunlight. 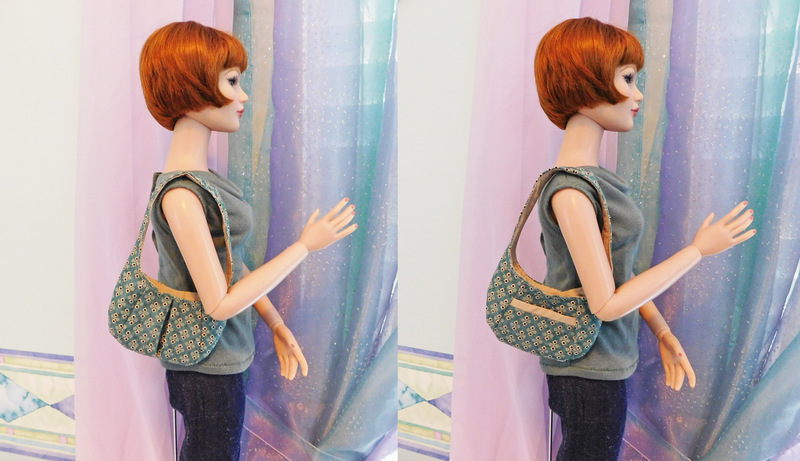 I tried to make a tote bag for my sister’s 18″ doll, but the first sample came out smaller than intended. 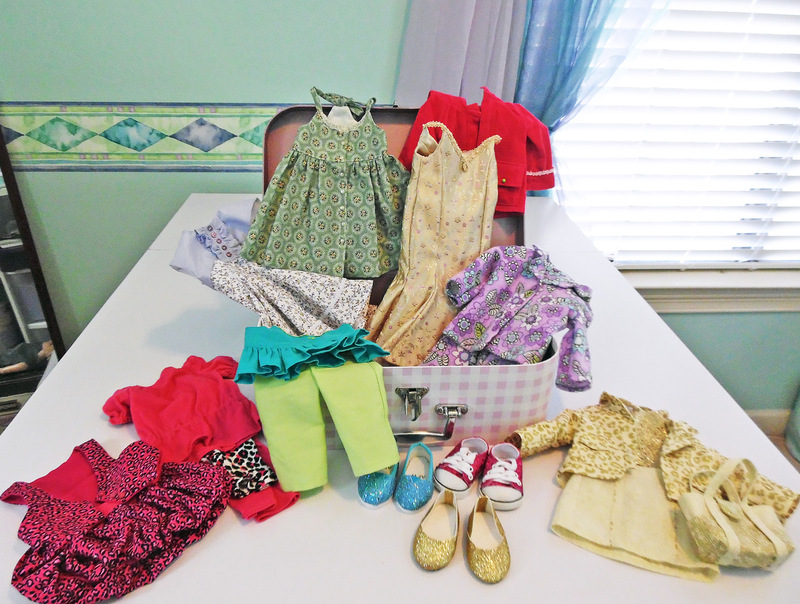 By coincidence, it happened to be exactly the right size for my 22″ American Model fashion doll. Delighted with how cute it was, I decided to make an entire line of handbags, including two different totes and a hobo purse. For a long time, I’ve wanted a professional pressing station. 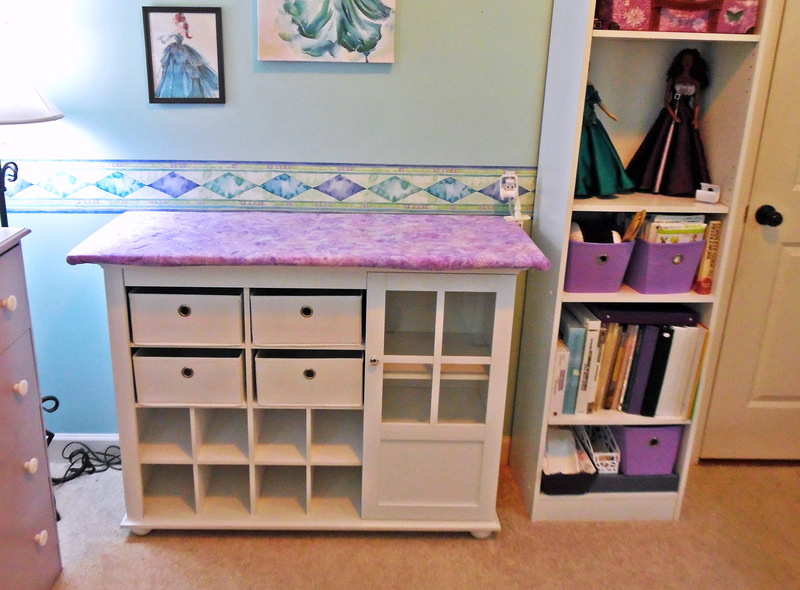 I finally found a cabinet that was the right size and had plenty of storage space, so I ordered it, assembled it, and then made a wooden top for it. The top is a flat sheet of wood that I wrapped in heat-proof batting and cotton batting. 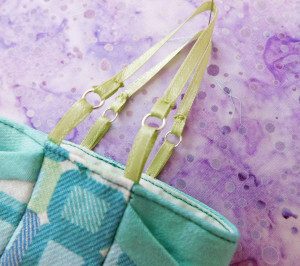 The cover is a lavender cotton batik, to which I added a drawstring, so it can be taken off for washing. When I bought a new digital camera, it came with a neck strap that was stiff and scratchy, as well as ugly. So I crafted myself a slipcover for the strap, using a dark purple quilting cotton. To pretty it up, I sewed a band of antique lace down the middle of the strap, then placed purple velvet ribbon along the edges. 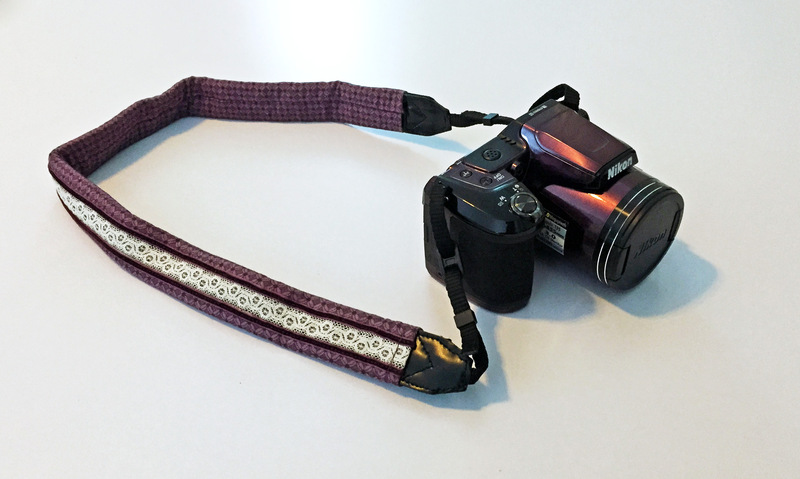 To make the strap less irritating, I padded it with quilting batting. 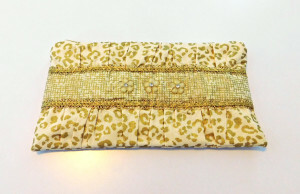 My younger sister loves anything with animal-print, so when I found a metallic gold leopard-print cotton, along with a couple of coordinating fabrics, I knew I had to make her something from it. 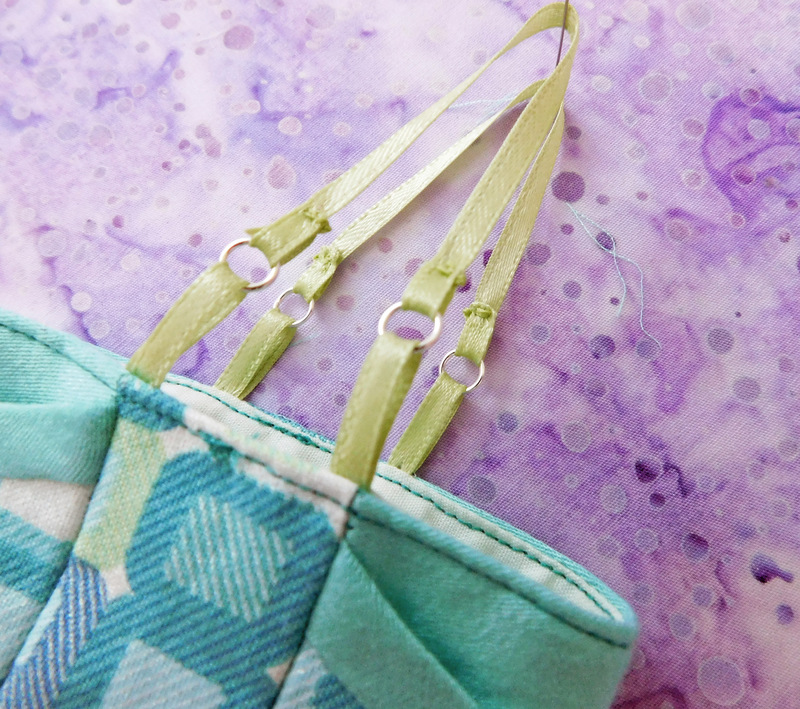 I settled on a fully lined zippered pouch that I’d sewn a few times before. 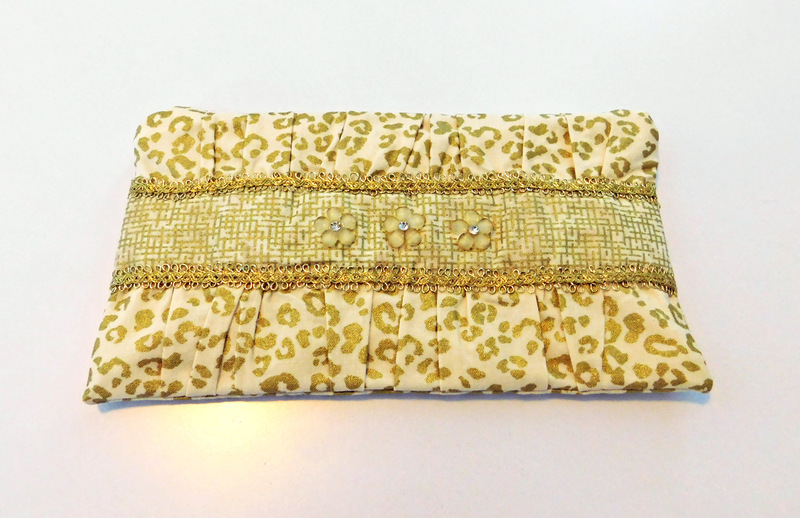 The front is gathered, with a contrasting panel down the middle, to which I added gold braid and floral buttons. 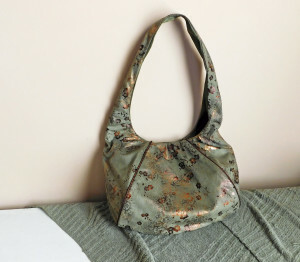 While fabric shopping earlier in the year, I found an olive green faux suede with floral copper foil accents. 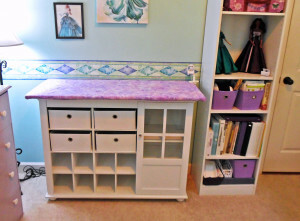 It was simply gorgeous, but rather expensive, so I only bought one yard—and I had no idea what I was going to make from it. 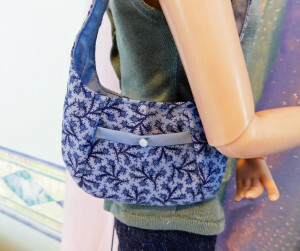 Eventually, I decided to sew a purse, but it took a lot of searching to find a pattern that would work. 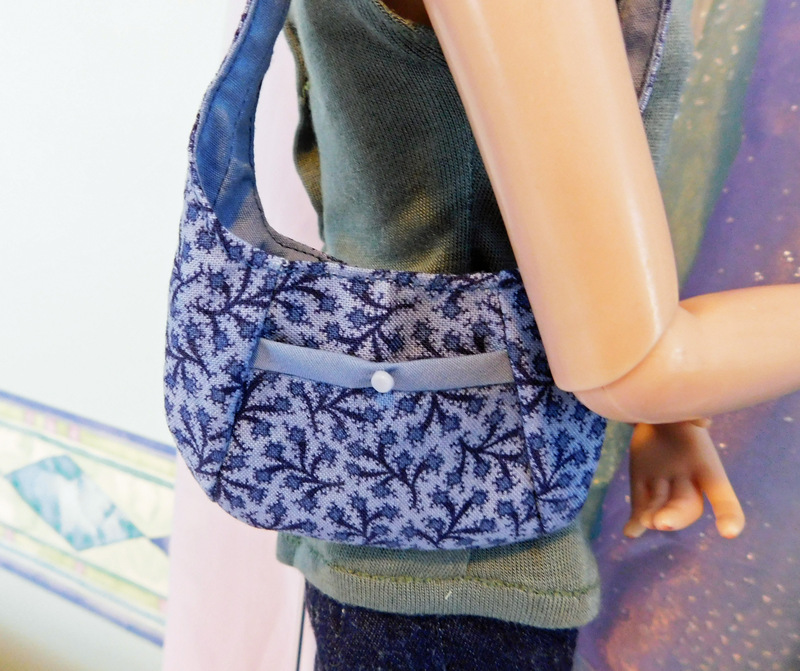 I’d never made a full-sized handbag before, so it needed to be relatively easy, but not too simple, and elegant, but still practical. Since I love hobo bags, I was thrilled to find a free pattern for one that met all my requirements. 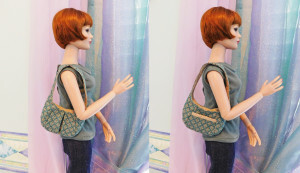 The only thing I would’ve changed (in hindsight) would be to add interior pockets, to make it more useful as a purse. And that was my year, in a nutshell.